At first cause of damage has to be determined and then steel is exposed to evaluate present condition. Then preparation of steel surface is conducted for repair. Appropriate steps for preparing reinforcement will ensure us whether repair will serve as long-term or temporary solution. For this purpose, the concrete surrounding reinforcing steel has to be removed. While replacing steel, the concrete also has to be removed and the most common and inexpensive, though a shot-term solution, is to remove concrete near delaminations or spalls found on concrete surface. The term ‘short term solution’ –is included as this approache of removing optimum amount will leave concrete that is generally contaminated by chloride of different metal. We know such contaminated concrete is frequently subjected to further corrosion. So this type of repair will actually provoke corrosion in surrounding area of receiving repair material. All damaged, weak and loose concrete must be chipped off. 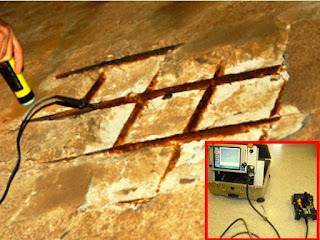 If rebars are exposed partially but surrouing unsound concrete is removed, no need to expose full circumference of any rebar by removing additional concrete. 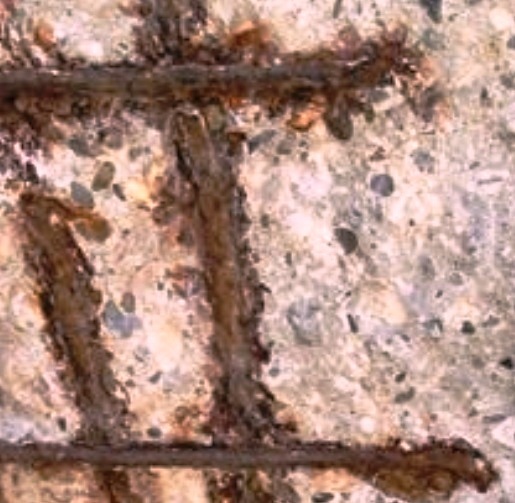 Sometimes reinforcing bars may have loose rust or products of corrosion or have lack of proper bond with surrounded concrete, in this case, it is recommended to continue removal of concrete to provide a clear space of (1/4 in +maximum size of aggregate of repair material) behind reinforcing steel. The steel found in deteriorated concrete may be either reinforcing steel or prestressed steel; in either cases, most frequent damages are found due to corrosion. Extensive care is taken to ensure removal process not to disturb or cause further damage to both reinforcing/prestressing steel. Impact breakers can damage reinforcing/prestressing steel heavily, if equipment is applied without determining location of reinforcement in concrete member. Perhaps you have idea about pachometer; it helps to determine position of reinforcement in concrete member by providing information about depth and location of them. Besides, structural drawings, if available, can be used to locate location of reinforcing steel. Pachometer is required when structural drawings are not available or construction was not followed structural drawings. When major portion of deteriorated concrete is removed, the concrete in vicinity of reinforcement should be removed carefully not to damage reinforcement or disturb bond between reinforcement and surrounding sound concrete by vibration of removal; in this regard, small chipping hammer is recommended. Loose mortar on exposed surface of reinforcement should be cleaned thoroughly. Sometimes wire brush or other hand held tools are used. But extreme care have to be taken; details of cleaning before repair of reinforcement will be discussed in upcoming post. Thank you for sharing the useful info, we also provide Architectural Engineering Design Services in Maryland, Northern VA & DC.